A simple calculator that adds binary numbers may herald the end of computer chips as we know them. Researchers at Harvard University assembled the rudimentary computer out of nanowires 3,000 times finer than human hair using a simple manufacturing process. The process could make computers that are small and cheap enough to be built into everything from tires to wallpaper. The nanowire design could be ready for practical use before today's silicon technology loses out to the laws of physics in the quest to make smaller and faster transistors. The breakthrough was being able to form a transistor simply by crossing two of the nanowires. A silicon nanowire carries electrical current when a perpendicular galium nitride nanowire lowers the silicon nanowire's electrical resistance, turning the transistor on. "We have developed a... crossed-nanowire field effect transistor that is readily amenable to high-density integration without the use of lithography," said Charles Lieber, a chemistry professor at Harvard University. Today's computer chips are made using photolithography, a process that uses light and chemicals to etch lines into silicon wafers. The process requires vacuum chambers, powerful lasers and hazardous chemicals, which is why state-of-the-art chip factories tend to be billion-dollar facilities. The best photolithography techniques produce wires as narrow as 130 nanometers, and fit 10 to 100 million transistors on a square centimeter of silicon. The researchers' process will allow several orders of magnitude more transistors to be crammed onto a chip than semiconductor technology is predicted to provide even a decade from now, said Lieber. The nanowire transistors could be packed one billion to a square centimeter, and narrower nanowires would permit one trillion transistors per square centimeter, he said. Transistors are electronic switches that turn current on and off to represent the ones and zeros of computing. The researchers combined nanowire transistors to form several types of logic gates, which use these on and off states to do calculations. They made simple logic gates that performed OR, AND and NOR logic functions. An OR gate turns on if either or both of two inputs are on, an AND gate turns on if both inputs are on, and a NOR gate turns on if both inputs are off. The researchers also combined these simple logic gates to form more complicated logic units, including a half adder, which adds binary numbers together. Computer processors are made of combinations of these more complicated logic units. The researchers built the transistors by chemically growing silicon and galium nitride nanowires 10 to 30 nanometers in diameter and several microns long. They coaxed the nanowires to form circuits by suspending them in fluid and flowing the mixture across a surface. The tiny wires line up in the direction of the flow. They placed the silicon nanowires in one direction and the galium nitride nanowires in a perpendicular direction. Simply putting the wires in place was enough to assemble the gates: the nanowires are so small that atomic forces make them stick when they touch. Semiconductor nanowires make good computer chip building blocks because their long, narrow shape and good electronic properties enable them to be used both as wiring and to make functional devices like transistors, said Lieber. The researchers' nanowire transistors boost electrical signals as they pass through, which makes it possible for many of them to be connected without the signal fading away. Though the researchers were able to build the logic gates chemically, they had to connect groups of gates using lithographically-formed electrodes, and they had to position the nanowire logic gates on the electrodes by hand. The researchers are currently working on assembling the nanowires directly on the electrodes, said Lieber. They are also looking to connect the logic units nanowire-to-nanowire, which would make it possible to build entire computer chips using only the chemical assembly technique, he said. Ultimately, chip factories could boil down to microscopic channels and reservoirs. "In the alignment and placement phase of nanowires... microfluidic machines [could be] the critical fabrication-line tool," said Lieber. The results are exciting because the researchers coaxed transistors to self-assemble, said James S. Harris, an electrical engineering professor at Stanford University. "The most exciting result is that they could deposit these wires in an interconnected 3-D matrix, creating a true 3-D integrated circuit." However, the researchers will have to use a different chip architecture than the one used by today's computer chips, said Harris. Their architecture will have to be very highly parallel because the nanowires have high electrical resistance, which means circuits made from them will operate at relatively low clock rates compared to today's integrated circuits. "It will win only by extremely high density and parallelism, not speed," he said. 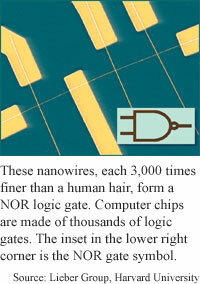 The nanowire process should be able to produce complicated integrated circuit devices in 5 to 10 years, said Lieber. Lieber's research colleagues were Yu Huang, Xiangfeng Duan, Yi Cui, Lincoln J. Lauhon and Kyoung-Ha Kim of Harvard. They published the research in the November 9, 2001 issue of the journal Science. The research was funded by the Office of Naval Research and the Defense Advanced Research Projects Agency (DARPA).